The 2014 IndyCar series opened March, 30 at St. Petersburg and ended at Auto Club Speedway on October, 30. The Championship had a good mix of ovals, temporary street circuits and road courses. There were eighteen races – three of which were double-headers (Detroit, Houston and Toronto). There were two manufacturers providing engines for the season – Chevrolet (Chevy IndyCar V6) and Honda (Honda HI14TT Indy-V6). The 2.2-liter twin-turbocharged V6 engines produced approximately the same horsepower – 550-700-hp depending on the turbo boost. The engine lease contracts ended prior to the 2014 season and as a result, some teams switched manufacturers. As usual, drivers played the game of ‘musical chairs’ but the biggest news was the return of Juan Pablo Montoya to open wheel racing. After a thirteen-year absence, Montoya joined Team Penske. Races thirteen and fourteen of the 2014 season were held at Toronto’s Exhibition Place. The event was titled, ‘2 IN T.O.’ and the two races were originally scheduled to be eighty-five laps around the 1.755-mile temporary street circuit. This was the twenty-eighth edition of the event. What made the event memorable was the heavy downpour that forced Saturday’s race to be rescheduled. After four failed starts, three accidents, two red flags and thirteen-laps, Saturday’s race was postponed to Sunday morning at 10:30 am – even the pace car, driven by Arie Luyendyk, tagged the wall. Starting positions for race-one were determined by qualifying times but the cars would line-up based on driver’s points for the final event. Race-one was six-five laps and the second race became a timed race after a number of full-course caution periods – 56-laps were completed. Sunday’s first race did not go well for ‘road racing specialist’, Mike Conway. Conway was gridded thirteenth but he was involved in a first lap crash that included Simon Pagenaud, Takuma Sato, Carlos Munoz and Josef Newgarden. He recovered to finish fifteenth. Later that day things went much better as late in the race he passed Justin Wilson and held off Tony Kanaan for his second win of the season. 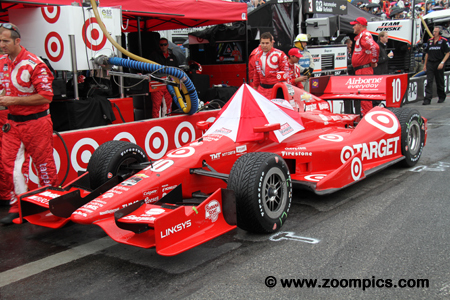 Target Chip Ganassi driver, Tony Kanaan would start race one fifth. 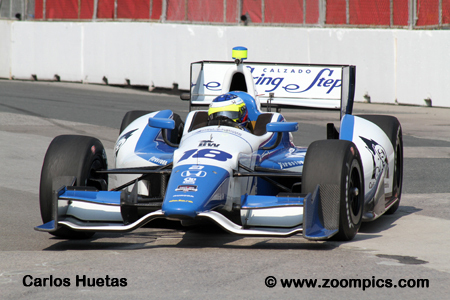 Kanaan was involved in an incident with Ryan Hunter-Reay on lap-39 but was able to continue and finished third. For round two in Toronto, he started ninth based on his points. During the race he advanced seven positions and finished second. Despite his two podium finishes, Kanaan only moved up one place in the Drivers’ standings. 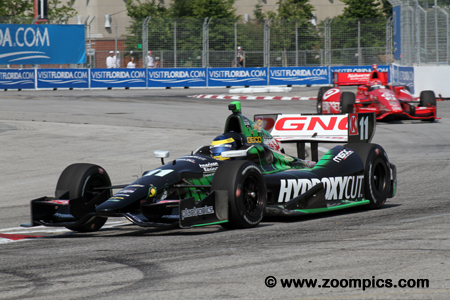 Sebastien Bourdais was optimistic heading into Toronto - in nine previous starts at this track he had eight top-ten finishes which included a win. His confidence appeared to be justified when he qualified on the pole for race-one and took the victory. This was Bourdais’s first win in seven-years. 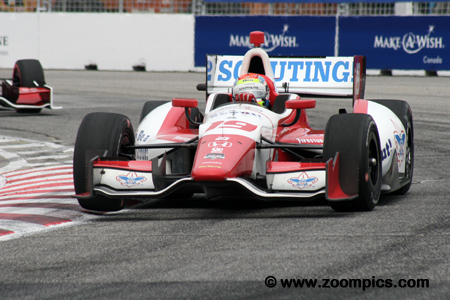 In Sunday’s second event Bourdais started from the tenth position and was ninth at the checkered flag. Winner of the Indianapolis GP and Houston II rounds, Simon Pagenaud, started fourth in the first race. On the opening lap, Pagenaud spun when he was hit by Luca Filippi but rebounded to finish fourth. In afternoon race on Sunday, he started third but after a series of problems completed only forty-seven laps and was classified in twenty-second. 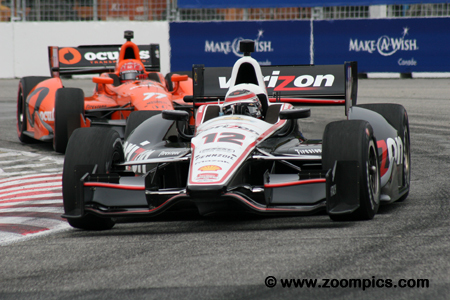 Qualifying second for race-one was Will Power the winner at St. Pete and Detroit. But Power was forced to start from the back of the field as a result of damage sustained during the attempt to get Saturday’s race under way. During the race, he gained fourteen places and finished ninth. In Sunday’s second race, Power started second and earned the last spot on the podium. 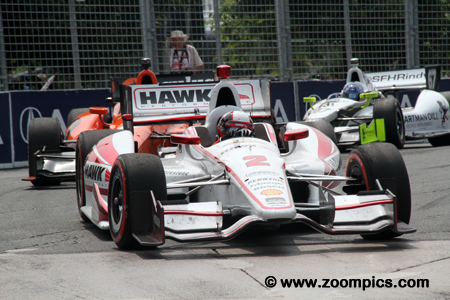 Entering Toronto, Helio Castroneves was the series points leader. In race-one Castroneves started and finished second which allowed him to pad his points lead. He was on the pole for the second race as starting positions were determined by the driver’s standings. An incident late in the race with several other cars damaged his front wing dropped him to a twelfth place finish. 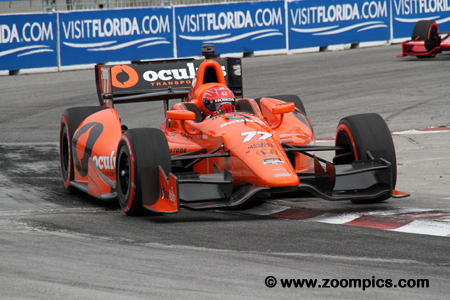 Charlie Kimball was able to capitalize on the problems of others to move from an eighteenth starting position in the first race to finish seventh. Kimball was equally impressive in Sunday afternoon’s race – based on his points he started sixteenth and was fourth at the checkered flag. His record for the weekend – improved eleven-positions in race-one and gained twelve-places in the second race. 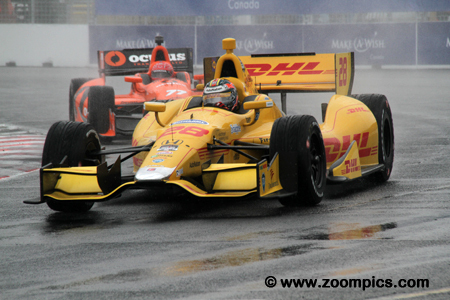 Ryan Hunter-Reay driving the No. 28 Honda powered Dallara DW12 for Andretti Autosport started third in the first race. Hunter-Reay was coming off a win in Iowa but his luck changed in race-one at Toronto when he collided with Tony Kanaan on lap-39 and retired. And the results did not get much better in the second race. On lap-51, he was involved in an incident that included four other cars and finished fourteenth after starting fourth. 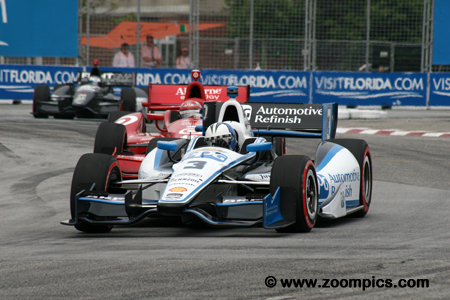 It was a difficult weekend for Team Penske driver Juan Montoya. In Sunday’s first race, Montoya qualified twenty-second and finished eighteenth – one lap behind the winner. Starting fifth for the second race, it appeared he would have better luck. Unfortunately, when the rain came on lap-12, he hit the tire barrier at corner-three and was rear-ended by Mikhail Aleshin. At the finish, Montoya was classified in the nineteenth position. The second and final caution in race-one occurred when Carlos Huertas contacted the wall in corner-three on lap-16. Huertas was able to continue and finished fourteenth. In Sunday’s second race, the Dale Coyne driver was involved in an incident at turn-three that included – Ryan Briscoe, Ryan Hunter-Reay, Marco Andretti and Carlos Munoz. He was fifteenth at the checkered flag. 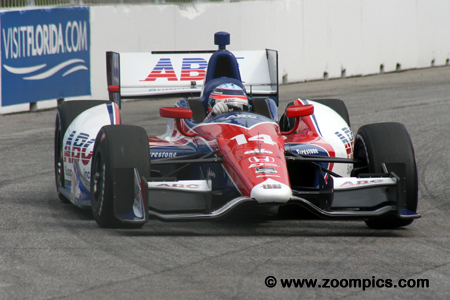 The first driver to retire in race-one was Takuma Sato. Sato, in the A.J. Foyt entry, qualified twelfth but was involved in an incident on the opening lap with five other cars that damaged his left front suspension. In the second race, he fared much better. Starting second last, he advanced seventeen-positions and was fifth at the checkered flag – his best result of the 2014 season. 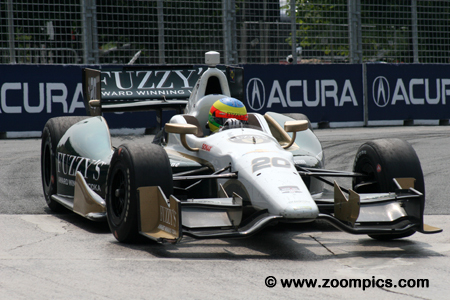 Another driver who had a history of success in Toronto was Justin Wilson. Wilson’s record at the track included a win, two poles and a third. In Sunday’s first race Wilson started seventh but after sixty-five laps of racing, he was tenth. Later in the day he started fifteenth based on his points but worked his way to the front. With less than nine-minutes remaining, he was leading but a bad tire choice dropped him to a ten place finish.